Two students and three staff members from the Pattonville School District collaborated to write a chapter for a newly released education book titled "Designing Successful Systems: Stories of Change, Volume 1." 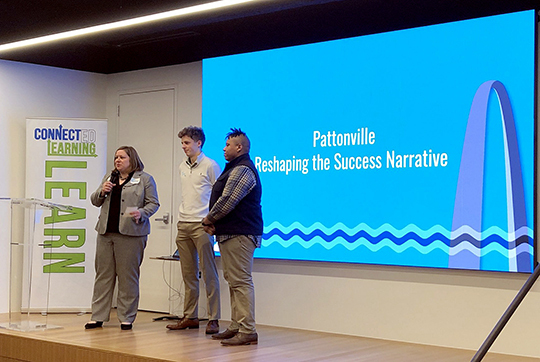 The Pattonville chapter was titled "Reshaping the Success Narrative" and was written by Pattonville seniors Aric Hamilton and Will Polster; Dr. Cara Hiripitiyage, director of secondary education; Dr. Tim Pecoraro, superintendent; and Mickey Schoonover, director of school-community relations. The book is a Connected Learning project edited by Dr. Robert Dillon, a 1992 Pattonville alumnus. Hamilton, Hiripitiyage and Polster presented on Pattonville's chapter during a book release party on Feb. 20. Pattonville's chapter describes improvements to ensure student success for all, Hiripitiyage said. "In the early 1990s, Pattonville faced challenges that required a new paradigm for reaching success," she said. "District leadership committed to the promise 'That ALL will learn' and began making academic and cultural changes to be more responsive to the needs of their students and families. These changes helped Pattonville become a leading school district and learn a new value: schools must always shift and grow to serve students best." Connected Learning's "Stories of Change" is a three-part series designed to share the hard work and dedication of teachers in classrooms, schools dedicated to modern learning and school districts striving for a greater definition of success. Two additional volumes will be published later this year. From left, Dr. Cara Hiripitiyage, Will Polster and Aric Hamilton share information on Pattonville's chapter in a new education book.